What each of these theories fail to take into account is the difference between an exchange of commodities as opposed to an exchange of capital with wage labour. Interchange of commodities and Distribution (wages, rent and profit) must be kept distinct from each other … the Laws of Distribution are not altogether dependent upon those relating to Interchange ([T. R. Malthus, Definitions in Political Economy, ed. by John Cazenove, London, 1853, ] Preface, pp. Vi and vii). This is also important for understanding the difference between capital-value, and the value of capital. 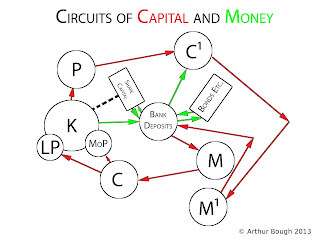 Capital value relates to the value of those commodities that comprise the elements of capital. For example, a machine, as a commodity that comprises part of the fixed constant capital of a business, has a capital value, say, of £1,000. That is the value of the machine, as a commodity, its value as determined by the labour required for its production. That value does not change unless the labour-time required for its production changes, and this value, as capital-value, only changes form. The same is true of say, 1,000 kilos of cotton that comprise part of the circulating capital of the firm. As capital-value, it is metamorphosed into different forms, as part of the reproduction process. A part of the £1,000 of capital-value of the machine is metamorphosed into the value of yarn, as wear and tear. The value of the cotton is wholly metamorphosed into the value of the yarn. Now, the capital value that was previously in the form of productive-capital has been metamorphosed into commodity-capital. The shape of the capital value has changed, but the capital value itself remains exactly the same. 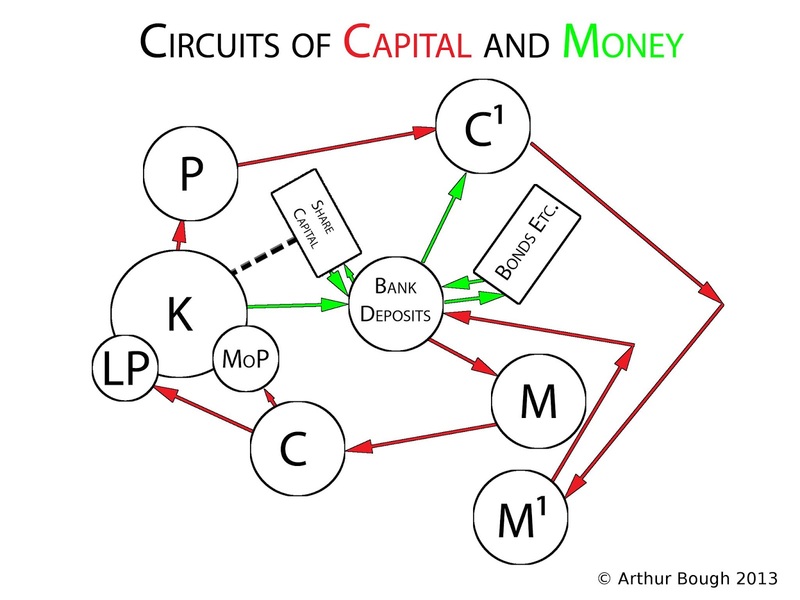 And, when the commodity-capital is metamorphosed into money-capital, when the output is sold, the capital value again remains exactly the same, although its form has once again changed. But, this is not at all the same as the value of the capital. As capital, as opposed to being simply commodities, such as a machine, or cotton, it has no value, because the use value of capital, as opposed to the use value of a machine, or the use value of cotton, that it is self-expanding value, is precisely that it commands more labour than is required for the production of these commodities, of which it is composed. This use value of capital has no value, because it is not the product of labour. It is the product rather of a specific, historically determined social relation. In that sense, it is like landed property, where land has no value, because it is not the product of labour, and yet landed property is able to obtain rent, precisely because, land itself has a use value, and in order to obtain that use value, a price must be paid, i.e. the rent, or to buy the land, its price, in the form of the capitalised rent. A capitalist who owns wage goods, with a value of, say, 100 hours, by using them as variable-capital, is able to command not 100 hours of labour, but, say, 200 hours of labour, employing 20 workers to provide 10 hours of labour each. The use value of the capital is to be able to turn this 100 hours of value into 200 hours of value, and it is that use value for which a price must be paid, in the form of the rate of interest. Similarly, a capital value of £100,000 becomes a capital value of £110,000, where the average rate of profit is 10%. In other words, £100,000 of commodities acting as capital, commands not £100,000 of labour, but £110,000 of labour. It is this confusion between the value of commodities, and the value of capital that Marx now examines.